When Axzion’s lifting equipment is used, there is no room for error. Because when the foundations for offshore wind farms, weighing hundreds of tonnes must be safely lowered on to the seabed, there is no second chance. 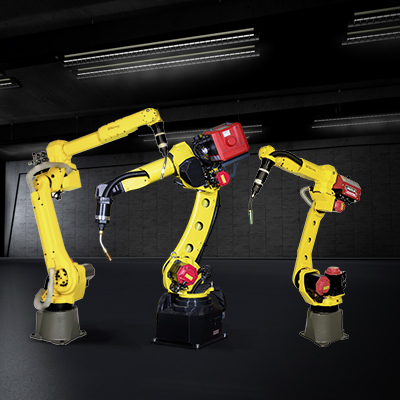 The welded seams of these gripping elements are performed by a comparatively slender ARC Mate robot from FANUC. It performs this task so well, compared to manual welding, that the effective cost savings reach well into the double-digit percentage range. As Ray Baumann, welding engineer at Axzion in Neustrelitz comments: “At the very least, we win back our leasing charge for the system.” This seems to be a relaxed attitude, but it is primarily a result of the high technical standards in the welding area and the decision to rely on a high-performance welding system with FANUC robots. An interesting detail of the company's history: founder and partner Ehnimb succeeded in making a milestone in the history of the automobile with the invention of the seat belt, which was built for Volvo for the first time. Following previous experience with a welding robot from Cloos, Axzion has been working with a new system since 2016, which was implemented by the Berlin based systems integrator H. Euen GmbH. Axzion only had a few requirements: It should be a portal system for welding components up to 10 m in length and with a piece weight of up to 5,000 kg. An EWM welding current source should also be used for automated welding, as the best experiences with manual welding had been shown by the EWM “forceArc” process. There was also another aspect that spoke in favour of an EWM/FANUC combination: As all the approvals (WPQ) for welding processes are laid down using EWM current sources and the corresponding processes have been certified, it was desirable to remain with this and use this experience. It was also important for the task at Axzion, that the robot should work with both single-wire and tandem torches. Axzion did not specify the brand of robot. Workpieces with a piece weight of up to 5,000 kg can be welded on the system. Baumann: “We do not carry out any out of position welding.” Nearly all welded seams are welded in PA and PB positions. For this purpose, a single-wire torch or a tandem torch is used on the robot, which are located in a changeover device on the portal. There are two corresponding torch cleaning stations. A torch cleaning procedure takes place at the tandem torch approximately once every hour. An indoor crane is used to place the pre-tacked workpiece on the rotary table. Different mountings, holders and clamping elements hold the workpiece in such a way that it can be welded free of distortion. In order to really be safe, operator Ronny Hahn sometimes makes an additional welding point. Finally, the free access of the robot to the workpiece must not be made more difficult by clamping elements. And the operator must ensure clamping that is suitable for the robot, so that it can also reach the weld seam with the best possible angle of incidence of the torch. Thicker steel plate - in the case of Axzion plates thicker than 30 mm - are preheated to 100 to 130°C. Simple cross members are now welded fully automatically and without further supervision. Apart from this, if something were not right, the experienced Ronny Hahn would already hear it from the noise of the torch. But what does “simple” mean at Axzion? Ray Baumann considers, “Many metres of a straight weld and a potential level of automation of 85 percent”, as optimum. He has just one further “qualification feature” for automated welding work: “The level of programming should not exceed more than 20 percent of the process time.” Only if several identical parts were welded, would a higher programming effort be worthwhile.